Apple discontinues smaller capacity models of iPod music player, but continues with product. We all know that there have been tremendous changes in the way we listen to and store music. Just 10 years ago portable mp3 players were considered the hottest gadget; they soon fell out of favor when smartphones entered the scene. Apple too has pretty much become a household name with the release of iPhone that runs on iOS. But that surely didn’t stop Apple from offering dedicated music players in form of iPods, which should’ve become obsolete way back. Now Apple Inc. certainly has realized this with decreased iPod sales and finally decided to pull the plug on iPod Nano and iPod Shuffle. WILL I STILL BE ABLE TO BUY IPOD MUSIC PLAYER? Regardless of them discontinuing the low end models, Apple have made clear that they will continue selling iPod Classic and Touch models. Moreover, they also increased iPod Classic’s storage to 128 GB and iPod Touch Wi-Fi model with 32 GB storage. This clearly shows how Apple is still committed to their iPod line of music players not caring whether people actually need them or not. WHY IS THERE STILL AN IPOD? As silly as this question might sound, but experts often ponder at the fact that Apple still wants to market obsolete technology. But despite of being obsolete there is still considerable amount of market demand for iPods and Apple surely doesn’t want to let any fraction of their sales go to waste. Nevertheless, we all know that these gadgets are almost circling the drain and will eventually face extinction. Nintendo SNES Classic pre-orders cancelled by Walmart. The drama surely doesn’t end for Nintendo, especially when it comes to their Classic Mini consoles. 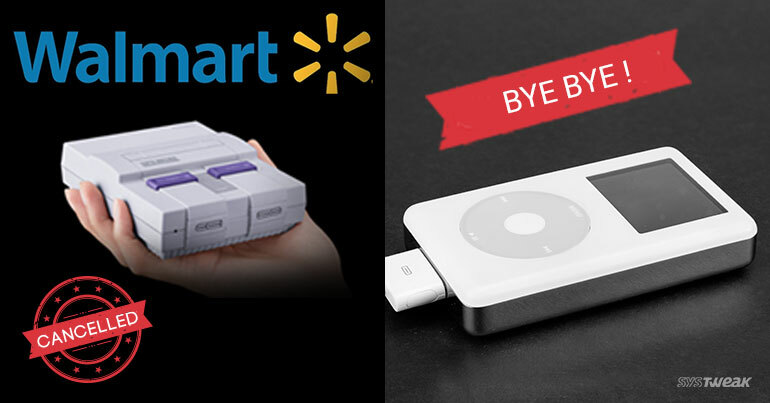 Their 8-bit NES Classic Edition was plagued by low stocks and now Walmart have cancelled preorders for SNES Classic Mini that is set for November release. This started with Walmart putting up a listing for Super Nintendo Mini pre-order. However, they recently issued emails to all customers cancelling all orders due to Nintendo’s tentative release date for the 16-bit console. WILL THIS AFFECT SNES SALES? There were some users who expressed their disapproval on Twitter, but this only adds to the hype for SNES Classic Edition. In fact, the biggest threat to SNES Classic is Sega Genesis Flashback, which is also up for pre-order alongside Atari. This could be a major pain for SNES fans, who might find themselves divided on what 16-bit machine they should get. To make their prospects even stronger Nintendo have also shipped a fresh batch of NES Classic consoles back in store for all customers who couldn’t buy it last year. While Walmart have clearly blamed Nintendo for putting up a premature listing for Super Nintendo Classic Edition, its release date is still shrouded with speculations. While the official page for SNES Classic Mini is set for September in UK, there are rumors about it being pushed back till November. So it seems that regardless of pre-orders or not, fans will have to wait this one out.